1. Drag out the beer cooler and fill it with ice. 2. Throw on some rubber gloves or our Kevlar Gloves (the fingers and padding are rubberized). 4. Check everything for freezer burn - throw away anything that's accumulating ice crystals. 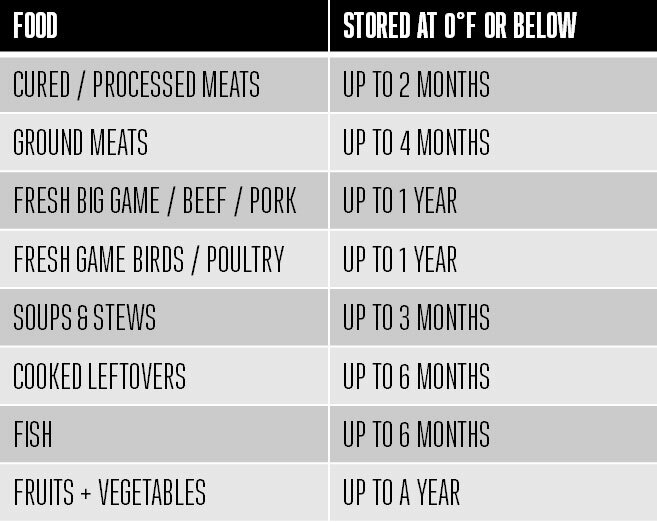 If these foods are vacuum sealed properly, they should last 3-5 times longer than the listed times in the chart. Ultimately, your senses are the best guide to freshness. Always check for funky colors or odors. 6. Throw everything else that's not freezer burnt or expired in the old beer cooler. 7. Chip away the ice building on the sides of the freezer with a spatula and throw it in your sink to melt. 8. Use undiluted vinegar to wipe down the walls and shelving of the freezer. 9. Plug the freezer back in. Monitor its temperature. So long as it's getting colder, you should be able to return the still frozen food items after 30 minutes. The frozen foods will help to lower the temperature. After a few hours, the freezer should be back to 0°F. 10. 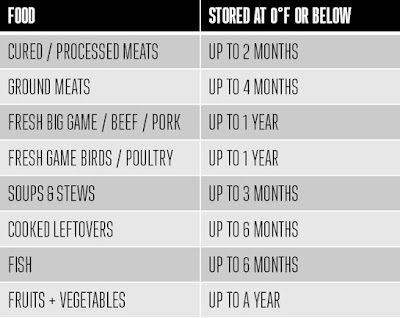 Transfer what you can of the good, non-freezer burnt, not expired food to better packaging. Seal everything with a Vacuum Sealer to ensure as much air as possible is removed from your foods. Good candidates for repackaging are store-bought meats that are on styrofoam trays wrapped with plastic, liquids packed in plastic storage containers, and anything in reclosable freezer bags. All of these tend to allow air in your packaging, and you'll see those little ice crystals called freezer burn building on the surface of your foods. 11. 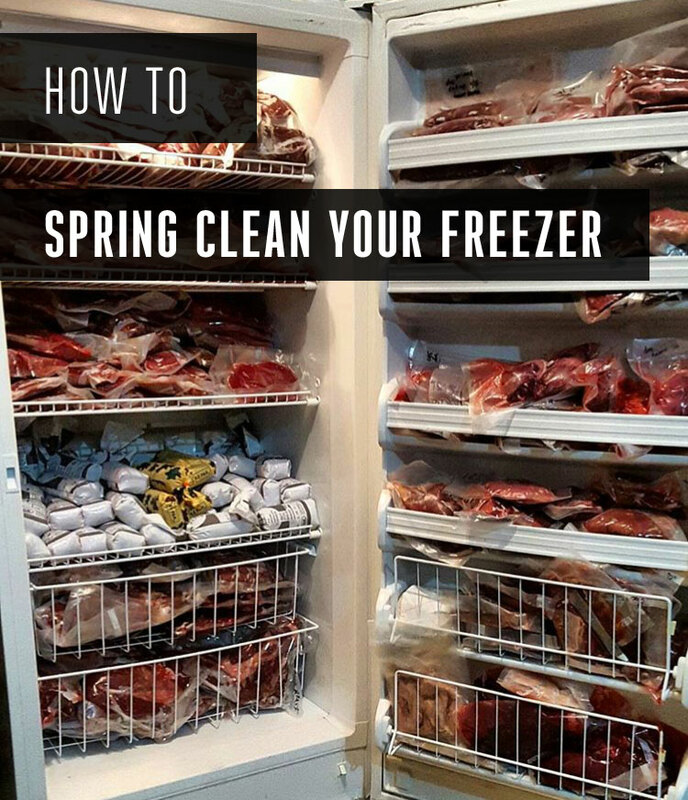 Load everything back into the freezer. When you load, try to spread packages out into one layer, rather than stacking them. This helps them freeze evenly and keeps your freezer working efficiently. It's also a good idea to take inventory of what you have as you load and record it on a chalkboard nearby or a sheet of paper stuck to the freezer with a magnet. Sometimes foods in the freezer fall into the 'out of sight, out of mind' void. Use a Vacuum Sealer to store just about any kind of food you're freezing. Using a Vacuum Sealer not only increases shelf life and freshness, it's also helpful for organization. Vacuum Sealer Bags are transparent, allowing you to check freshness without opening the bag. They are also made of a permanent-marker friendly plastic, so you can easily label all of your foods. Zipper Seal Vacuum Bags are also a great option for items that you're storing long term, but that you might need to store short term later on. They allow you to vacuum seal for the freezer items that you're keeping for 6 months to over a year. You can then open the package, use what you need, then use the zipper seal to seal the leftover food for a week or so in the fridge. Use Freezer Paper & Tape to wrap steaks and chops tightly if you don't have a Vacuum Sealer. Freezer Paper is also easy to label, so you'll be able to identify the freeze date and contents of the package without opening the paper. Ground Meat Bags are the best way to store ground meat in the freezer if you don't have a Vacuum Sealer. They too allow for easy labeling and are made of polyethylene to keep the light out and protect the ground meat inside.